When they hear the words "animal abuse", most people think of cats and dogs. 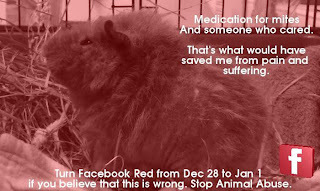 However, guinea pigs and other small animals suffer from abuse as well. 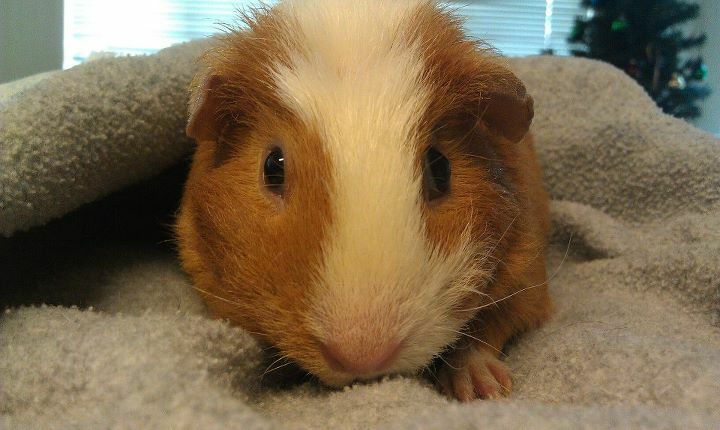 Nonetheless, a little care and compassion can go a long way towards saving a guinea pig's life. 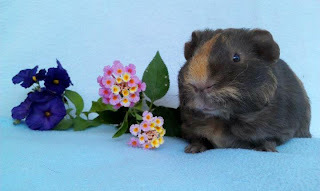 Krusty, pictured above, is one of the many cavies rescued from the Baldwin Park hoarding situation, where more than 150 guinea pigs were found abandoned and suffering from extreme neglect. He was afflicted with starvation, dehydration and a case of mites so severe that even lying down caused him pain. According to Orange County Cavy Haven, if the mites were caught early enough all he would have needed was food, water and Ivermectin. Since Krusty's mites were so advanced he also needed pain medicine and antibiotics, but with some care and attention he was able to make a full recovery. Krusty is now well and available for adoption. Cowgirl is another one of the piggies from the same hoarder. She was found suffering from mites, malnourishment, and dehydration - all while pregnant. To make things worse, she had been attacked by a raccoon since she was living abandoned in a backyard with no food, water, or protection from predators or the elements. OCCH also took her in and cared for her. They are happy to report that she is now the boss of her cage and her babies have been adopted to wonderful homes. We are grateful to all animal rescue organizations for rescuing abandoned animals, nursing them back to health, caring for them, finding them good homes, and educating people. As you can see from these before and after pictures, a little care and compassion can turn a piggy's life around. Please help reduce animal abuse by raising awareness! 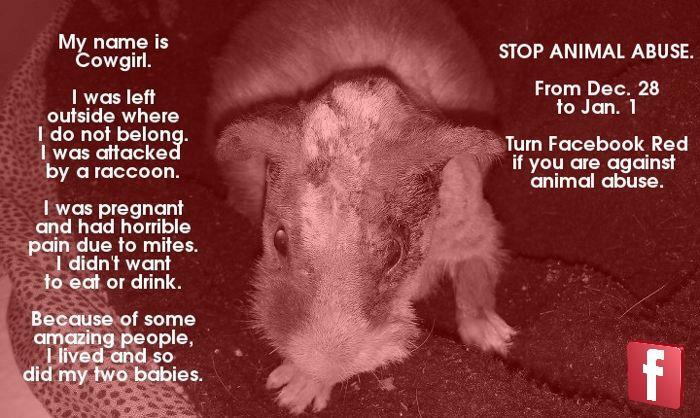 Even the smallest creatures deserve a chance to live and be loved. Oh my God, those poor pigs, it makes me so angry what people will do through ignorance or willful neglect. UK (and others outside the US) piggy people, please remember that you can donate to animal shelters like OCCH via PayPal. We are very thankful for animal rescues.. they give so many unlucky animals a second chance.